Find all E-Z-Go Residential vehicles in New Jersey. E-Z-Go was born in a cramped one-room machine shop and two brothers’ belief that they could build a better golf cart than what was available in the market. Now, E-Z-Go is considered a world leader in the transportation industry – becoming a leading global manufacturer of golf cars, and utility and personal transportation vehicles. The company has since built and manufactured thousands of vehicles per year, most of which feature game-changing technology and innovations that aim to improve vehicle efficiency and enhance user experience. E-Z-Go joined the ranks of Textron Inc. in the 1960s – along with powerful brands such as Cessna, Beechcraft, Hawker, Bell Helicopter, Greenlee, and Jacobsen and Kautex. Textron Specialized Vehicles currently design and manufacture all E-Z-Go vehicles, along with other commercial and industry utility vehicles such as Textron Off Road, Arctic Cat, Jacobsen, Dixie Chopper, Cushman and Textron GSE – all of which are recognized leaders in their respective industries. 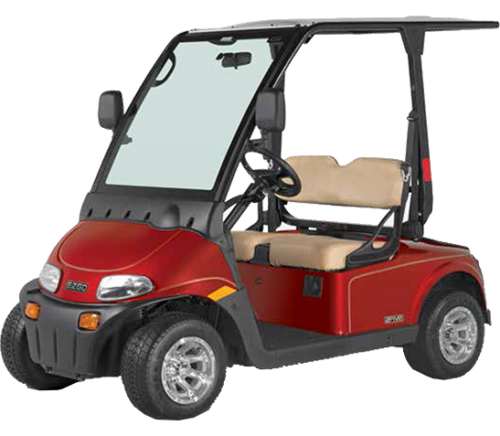 Get your own E-Z-Go residential golf car today! For any inquiries and concerns, feel free to drop us a note here in our site and we would be more than happy to assist you. The 2 Five: School and errand runs are guaranteed to be fun and enjoyable with E-Z-Go’s 2 Five series. 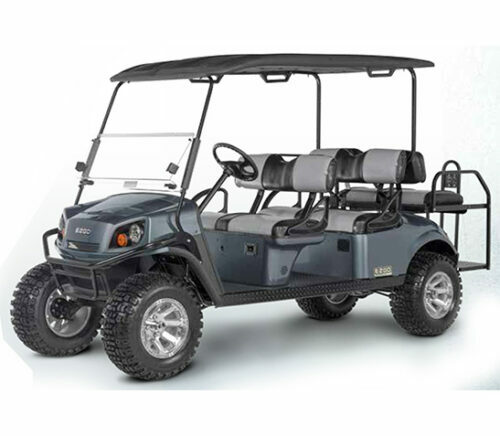 Inspired by get-up-and-go lifestyles, the 2 Five series is the perfect residential golf cart with its spacious interior, comfortable seats, and technologically advanced accessories. It runs on a 48-volt AC motor and six 8-volt deep-cycle batteries. The 2 Five Series come in two models: the 2 Five 2 Passenger and the 2 Five 4 Passenger, which both seat four passengers with an 800lbs load capacity. The Freedom RXV: E-Z-Go’s RXV series comes in either electric or gas – making it the perfect option for people who might need a bigger driving range. This series optimizes style, comfort, and space, and even includes accessories such as deep cup holders, and contoured seats. The Freedom RXV comes in two models: the Freedom RXV that seats two passengers, and the Freedom RXV 2+2 that seats four passengers. The Freedom TXT: Similar to the Freedom RXV, the Freedom TXT also comes in either a 48-volt DC electric motor or a 4-cycle 24.5 cu in (401cc) low emission gas engine. At the same time, the Freedom TXT is spaciously built, has 18” turf tires, stylish signal lighting, and ample storage for all your hauling needs. It has two models: the Freedom TXT that seats two passengers with an 800lbs load capacity, and the Freedom TXT 2+2 that seats four passengers with an 800lbs load capacity. 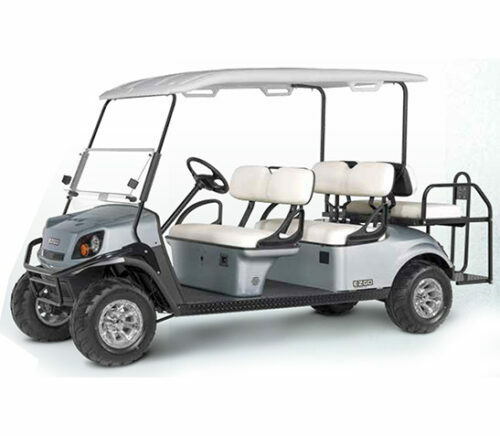 The Express S4: E-Z-Go’s Express 4 series is the perfect residential golf cart with its ample seating capacity and convertible rear seats. 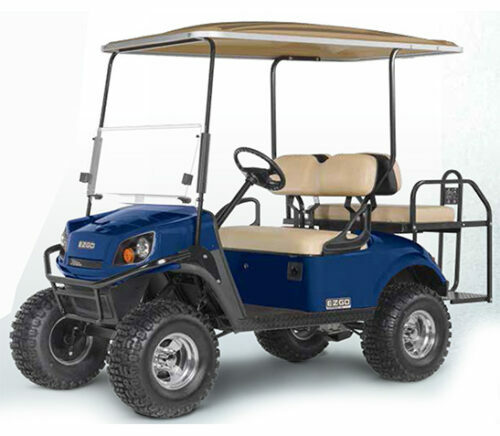 It is beautifully designed with comfortable seating and hydraulic shock absorbers, and comes with a powerful 38-volt DC motor and six 8-volt deep cycle batteries. The Express S4 comes in two models: the Express S4 and Express S4 High Output that can both seat four passengers with an 800lbs load capacity. The Express S6/L6: E-Z-Go’s Express S6 and L6 models are the perfect residential golf carts for bigger families with their six passenger seating capacities. At the same time, both models are graceful yet sturdy and powerful, with their shunt wound motor, 48V DC electric system, and hydraulic shock absorbers. The Fleet TXT: Another E-Z-Go residential golf car that offers an electric or gas motor option is the two-seater Fleet TXT – coming with either a 48-volt DC electric motor or a 4-cycle 24.5 cu in (401cc) low emission gas engine. It also comes with a customizable TruCourse technology, comfortable and spacious seating, sun canopy, a unique drip edge, and an optional USB port. The Hauler: If you intend to use your residential golf cart for your haling needs, then you will love E-Z-Go’s Hauler series. The Hauler comes with either a 48V DC shunt wound electric motor or 4-cycle 24.5 ci (401cc) cylinder gas engine, advanced braking, and suspension system – all guaranteed to provide you and your family a comfortable ride, while also hauling all your stuff wherever you may need to go. It comes in two models: the Hauler 800 that seats two passengers with an 800lbs load capacity, and the Hauler 1200 that seats two passengers with a 1,200 lbs load capacity. The Elite Lithium: If you want an extremely energy efficient residential golf car, then E-Z-Go’s Lithium model is what you are looking for. It comes with Samsung SDI Lithium technology, which are energy efficient and requires minimum maintenance – which guarantees you a reliable and efficient ride. This model also comes with a five-year, unlimited amp-hour warranty, thereby giving you the lowest operating costs unseen from any other golf car model.